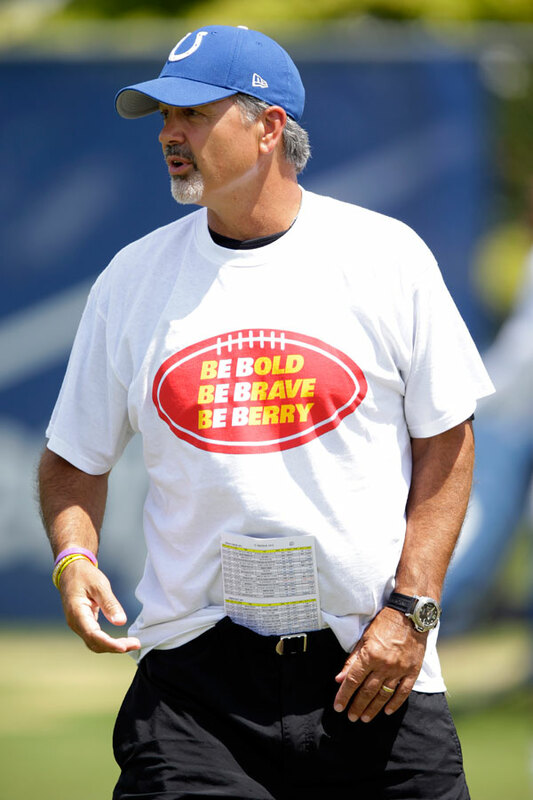 Indianapolis Colts head coach Chuck Pagano wore an Eric Berry shirt at training camp on Tuesday in support of the Kansas City Chiefs safety who overcame Hodgkin lymphoma. Berry, 26, was cleared to practice with the Chiefs last week after his diagnosis in December. The fifth pick in the 2010 NFL draft, Berry has made three Pro Bowls and was a 2013 first-team All-Pro selection over his four seasons with the Chiefs. Pagano, 54, battled leukemia in 2012 before returning to the Colts. Chiefs coach Andy Reid asked Pagano to reach out to Berry after his diagnosis, and the two were also close when Pagano coached Berry in the Pro Bowl in January 2014. At his return press conference last week, Berry mentioned Pagano while naming a list of teammates, coaches and Chiefs staff members who helped him through his battle.